I love Bob Mitchell’s works with traditional US Power Metal heroes ATTACKER, plus his participation in bands like e.g. SLEEPY HOLLOW proved to be of equal significance. Hence, the new ‘bout Bob being credited in a new band called SCEPTOR was nothing less than good news. Not to forget: apart from the passionate singer, the band features an all-German lineup and “Introducing…Sceptor” is their very first discographic attempt. The two songs featured in this 7” single have quite an American smell and can be briefly described as a mix of CAGE, METAL CHURCH, early SAVATAGE and (the European constituent) CANDLEMASS and JUDAS PRIEST. Bob’s throat – for those who are aware of his past works – is in an adequate level while he’s too deep in this scratchin’ cat singing in enough of his lines. The music stays loyal to the traditional Metal beliefs, with razorblade riffs and a neat will to deliver in-your-face solos and rhythm section parts. Both “Powerhouse” and “Shadows In The Maze” stay away from ultra-fast or ultra-low tempos, being mid-pace (or a little faster) numbers. The overall feeling is a good proposal for true believers of the 80s traditional Metal ideals, while I think it sounds too retro for juvenile metallers. 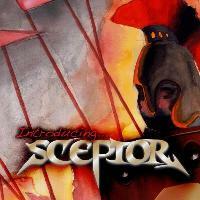 Is SCEPTOR a band that’s here to stay? They claim so, hence – I guess – the relative single title. Judging from these two tracks it’s quite obvious the way this outfit chooses to follow but we’d better wait and see in what ways they can handle a full album recording. For me, personally, the fact and only that Bob’s present here raises the expectation and anticipation high.